I called the Navigating Officer and the Gunnery Officer; the P.C.O. sighted 3 ships on our starboard bow and gave the alarm and the order to load the 8" turrets. The Captain quickly arrived to be first to reach the bridge. I sighted torpedo tracks approaching down the starboard side - the Captain ordered full ahead and starboard 35 to quickly swing the ship to starboard. The Navigating Officer reached the bridge and told me he had the "Con", thereby taking over from me. The Gunnery Officer had taken over from the P.C.O. and moved to the Port enemy bearing indicator. Further torpedo tracks crossed the bow. Ahead, star shell were lighting up the scene and aircraft dropped flares to starboard. As I left the bridge, we again altered course. I hurried to my action station in the fore control - there was an explosion amidships, we were hit on the 4" gundeck, the Walrus aircraft was blazing fiercely on the catapult. A shell exploded on the port side just below the compass platform and another just aft of the fore control. The plotting office received a direct hit. The shell that demolished the port side of the compass platform mortally wounded the Captain, killed Lieutenant Commander Hole, the Gunnery Officer, wounded Lieutenant Commander Plunkett-Cole, the Torpedo Officer and severely wounded Midshipmen Bruce Loxton and Noel Sanderson. I had virtually been surrounded by shell hits but luckily remained unscathed. In the fore control standing alongside me, Able Seaman Oliver was hit from the explosion just aft of our position - he was given morphene but was a very sick young man. The ship now lost power and took on a noticeable list to starboard. For CANBERRA, the war was over. Only 2-3 minutes had elapsed since the ship went to action stations. CHICAGO had about 16 feet of her bow blown off by another torpedo but she could still steam and the bulkheads held. She charged off to port but did not, in fact fire her 8" armament - she fired star shell from both her port and starboard 5" guns in the direction of her perceived position of an enemy cruiser - none of these star shells functioned. CHICAGO did not apparently warn the Northern cruiser force, but I will return later to this ship's movements and actions. PATTERSON had sighted the enemy and quickly broadcast on her T.B.S. "Warning, Warning, Strange Ships Entering Harbour". You will recall earlier I indicated CANBERRA was not fitted with T.B.S. , so that warning was not received by us. She had also signalled to us using a small blinker tube. PATTERSON had opened fire, but an order to fire torpedoes was not heard, the noise of her guns firing swamped out this command given by her Captain. PATTERSON was illuminated by the Japanese, fired upon and hit. However, PATTERSON did get off star shell and 50 rounds of gun fire. BAGLEY sighted the Japanese after PATTERSON and altered course to port so that she could fire torpedoes. But she swung too far before the primers were Inserted, It took another 3 or more minutes to bring her starboard tubes to bear and 4 torpedoes were fired, but without any positive result. BAGLEY also proceeded to the west, but of course Mikawa had long gone. After Mikawa had decimated the Southern Force, he swept on, split into 2 groups and opened fire on the Northern Cruisers at 0150 and 0200. Twice CHOKAI was hit, but not impeded. 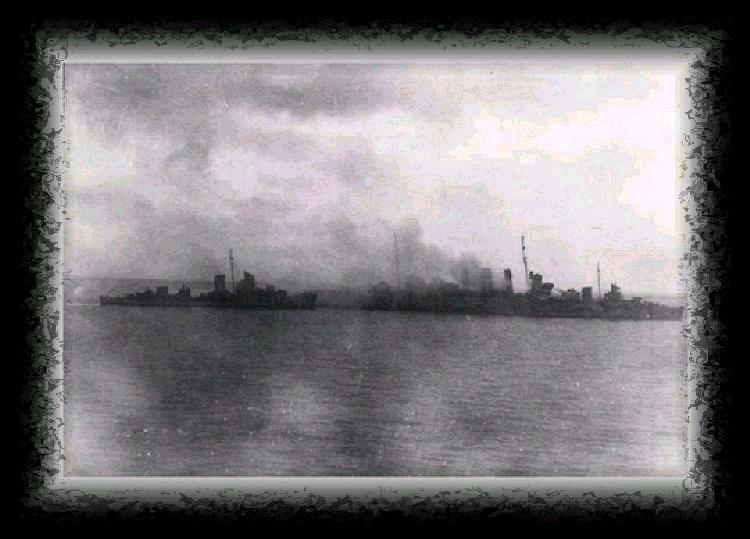 By 0240 the 2 Japanese groups were clear, they rejoined as one and made off for Rabaul and Kavieng at high speed. "The times in the above narrative are approximate, for the hands fell off the bridge clock on our first salvo and it was not realised that the Quarter Master was not making exact time records of the occurrences until some time later". We were blazing amidships with 4" ammunition exploding and we had developed a severe list to starboard. There was no power and no water pressure for fire fighting. The fore control was abandoned and I went to assist with the wounded and dump ammunition. At one stage, I went below docks in the vicinity of the Sick Bay flat - it was a shambles below. There were no lights, I used a torch, but the list made it difficult to proceed. Whilst I was below decks, the ship gave a shudder and suddenly took on an even greater list to starboard. I feared CANBERRA was about to capsize, I would be trapped and that this was the end for me. However the ship steadied and I scrambled back to the upper deck, and survival. I tried to move to the stern but could not pass the fierce fires amidships.